2003-2009 Mercedes Benz E320 4MATIC Wagon 4 Wheel Suspension Conversion Kit (MI24F) is the perfect solution to your air suspension problems. Designed to be very affordable, you can convert your air suspension to use standard. The air suspension system on your 2003-2009 Mercedes-Benz E320 4MATIC wagon may be going bad, or may be experiencing total failure. You may need a repair or a complete replacement. We have just the solution to whatever your air suspension problem may be. Our conversion kit converts your faulty air suspension to non-air suspension. This eliminates the dependency on those faulty assorted parts to function in sync 100% of the time. Simplify your ride, while improving its performance, with this premium coil spring kit. This kit includes two new pre-assembled front coil-over struts using Eibach coil springs, two new Eibach coil springs with mounts, and two passive hydraulic fluid and gas shocks for the rear end of the wagon. We designed the kit to be more affordable and reliable than the original equipment. In fact, we back it with our limited lifetime warranty. No modifications are required, and the kit is installed in about one hour per wheel. After thirty minutes the suspension warning message with turn off, too. DIYers love the pictorial instructions that come with the kit, along with accompanying information. Our experts uploaded videos of them performing real installations on our YouTube channel- watch them for extra help! Our in-house technicians are happy to provide you with support while you repair your bad air suspension and answer any questions about your E320 that you may have. You want to look for signs of a failing or leaking air suspension system on your 2003-2009 Mercedes-Benz E320 4MATIC wagon before it‚Äôs too late and total failure sets in. The most noticeable sign is a sudden uneven height difference between different sides of the wagon. Often this looks like a sagging in the rear or front end, while the other end remains inflated. This can be described as squatting or looking slammed down to the ground. A slight lean from side to side may also be present. Generally speaking, if you notice your E320 is not meeting and maintaining its appropriate ride height at all times, then a bad suspension is likely to blame. An illuminated suspension warning message on the instrument cluster will confirm this. Lastly, if the air compressor has stopped working or is running too often (will be very loud and unusual sounding), then you likely need an air suspension repair or replacement. You‚Äôll want this fixed immediately. = Only $1,595 (plus s&h). 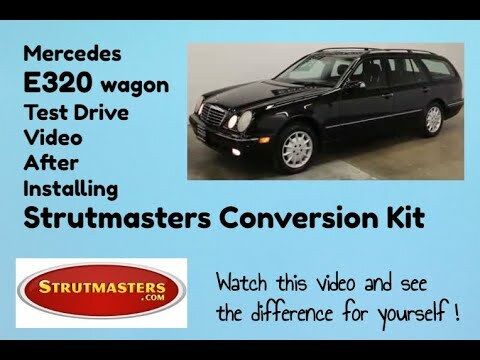 Choosing the conversion kit for the 2003-2009 Mercedes Benz E320 (4MATIC Wagon) saves YOU over $3,800! 2003-2009 Mercedes Benz E320 (4MATIC Wagon) Air Springs (x4)- (models with air suspension only) commonly referred to as air bags, a plastic and rubber bag that is fitted on top of the strut that uses pressurized air as a cushion instead of a metal coil spring to hold a vehicle off of the ground and off of its wheels. These are the number one cause of all air suspension leaks. All air springs all go bad at about the same rate. If one is leaking, the others will not be far behind. For a proper repair, all of them need to be replaced at the same time..